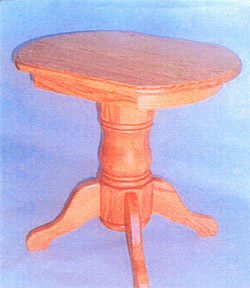 To make your pedestal-style living room complete, pick up a pair of our single pedestal end tables. Perfectly matched to our sofa table and coffee table, these are probably some of the most heavy duty end tables you can find anywhere. If you have pedestal style furniture elsewhere in your house you also get the advantage of being able to stick with your theme. Amish made out of solid oak, and designed to last a lifetime.